Of course anyone who has spent time on this site, knows that I have never made that claim. But the title is an attention getter, so I understand why they did it. For the record, I’m fairly positive you can’t beat cancer with just rebounding. Healing cancer requires a total life change. 30-60 minutes of daily exercise is critical component to health and healing, and rebounding was an important part of my exercise program while I was healing cancer. So despite the misrepresentation in the title, I think the news story turned out great. And hopefully you’ll get a few laughs from the pictures they used. So did you catch what the assistant oncology professor said? Hey doc, we have mountains of evidence. It’s called nutritional science and functional medicine. And it’s being ignored in favor of patented and highly-profitable pharmaceutical drugs. 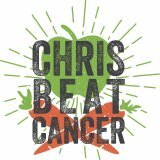 Although there are no phase 3 clinical trials on treating cancer with nutrition, there are thousands of of peer-reviewed studies on the anti-cancer compounds in fruits and vegetables, and hundreds of epidemiological studies on populations all around the world with very low cancer rates and long lifespans. The majority of these people groups eat whole food plant-based diets with very little animal products, get lots of fresh air, sunshine, exercise, and have very low stress. Beyond that, we have loads of testimonials from people, real people, who have successfully healed cancer naturally. This is patient-centered evidence. Check out all my posts and interviews with Natural Survivors. FYI: The rebounder I’ve used since 2004 is the ReboundAIR. I love it. Read my full post about rebounding here.